“Hello #1, Lg.” is stamped in blue on sage colored card stock which has been edged with a blue pen. On white glossy card stock, a shadow stamp is stamped in light peach. Three images are stamped twice in different colors. Those images are “Gecko, Sm.”, “Sunburst, Sm.”, “Anasazi Dragonfly #2, Sm.” Leaving a border, the stamped card stock is cut with deckle scissors and is layered over red glossy card stock which has also been cut with deckle scissors. Card by Margaret Wiggin. 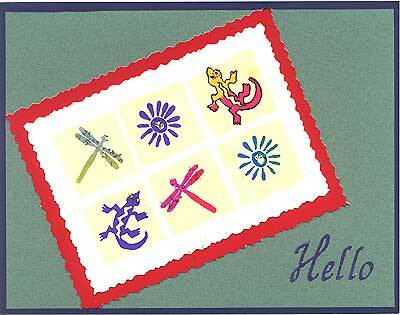 Tags: Anasazi Dragonfly #2 Sm., Decorative Scissors, Gecko Sm., Hello, Margaret Wiggin, Shadow Stamping, Sunburst Sm. 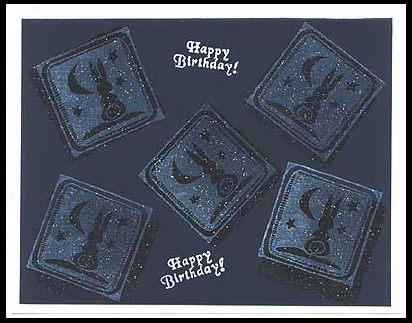 A shadow stamp is stamped 5 times on navy blue card stock using a Versamark stamp pad. “Bold Block – Celestial Bunny” is stamped and embossed in crystal white near, but not on top of the Versamark images. “Happy Birthday!” is embossed in white at the top and bottom of the card which is layered on white card stock. Card by Margaret Wiggin.